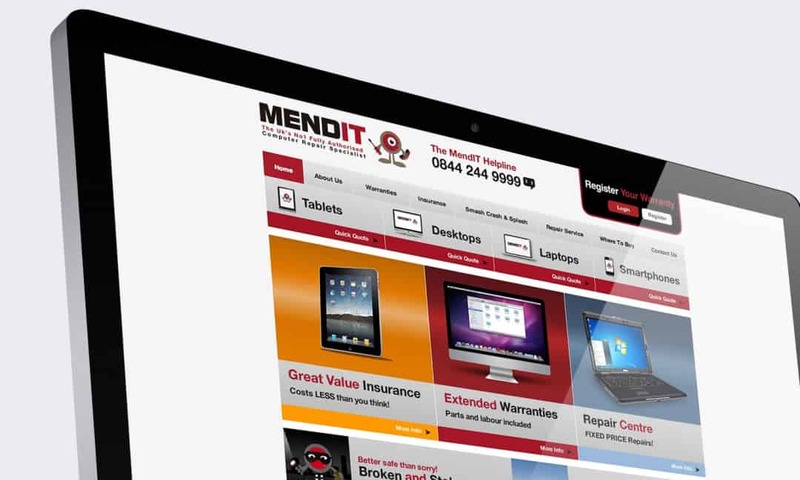 MendIT are both a UK leading IT repair centre and provider of IT extended warranty and insurance products. As an IT repair centre, MendIT employ fully trained and accredited engineers who repair everyday IT devices including tablets, laptops, desktops and smartphones. This means every repair is undertaken with the greatest care, efficiency and quality of workmanship. We were exclusively appointed by UK leading IT repair and warranty organisation MendIT to design and develop an on brand, eye catching corporate identity along with a new corporate website design and build. They wanted a clean, modern site that was easy to navigate through and that emphasised the specialist services they offer as a business. When you are looking to produce a new corporate identity for a business it’s important to firstly learn what the company is all about, how they operate and what their core values are; by doing this you learn the unique personality of the business which you can then look to incorporate into the design process. What our team ended up producing for MendIT was an identity that could be instantly recognised and more importantly remembered. It features a new MendIT mascot that can be used in future marketing material and promotions. With the new corporate identity comes MendIT’s new corporate website which was designed and developed with the end user in mind. The bespoke build demonstrates with ease the services on offer and features a unique ‘quick quote’ system enabling customers to get required information efficiently.